What is the Greater Canandaigua Community? Residents of the Town or the City of Canandaigua do not necessarily adhere to the idea that there is more than one Canandaigua community. We all share one Main Street and downtown, our pretty lakeside scenic drives, our rolling farm fields, and our lakefront parks. We don't stop to think about crossing between municipal borders as we run errands or visit spots around Canandaigua. Our local economy isn't tied to municipal boundaries either. If a new business moves in on Rochester Road near the car dealerships, it doesn't only benefit Town Residents. Likewise if a downtown building looses a tenant, City residents aren't the only ones affected by it. The greater Canandaigua community is, therefore, the whole community of residents living and working in the Town and the City of Canandaigua. The municipalities and the Chamber of Commerce need to work together to encourage local business retention, growth, and expansion in addition to recruiting new businesses to the greater Canandaigua area. A strong economy in both municipalities is a boost to the whole community. What is Group Concept Mapping? As a result of the idea explained above, the Town, the City, and the Chamber realized that one entity couldn't achieve a strong and sustainable regional economy acting in isolation from each other. We needed input from the entire business community on how best to preserve and enhance greater Canandaigua's economic vitality. To do that, we enlisted the help of an innovative and interactive software program called Group Concept Mapping, that is part brainstorming, part survey, and part statistical data mining. Unlike a traditional board room meeting, this software allowed the Town, City, and Chamber to include hundreds of local business and community leaders to participate equally in generating ideas to help our economy. And unlike a survey or poll, in addition to generating ideas, the participants were able to sort through, prioritize, and rate all of the ideas. The results of the project are available to view below in the final report, generated in May 2018. 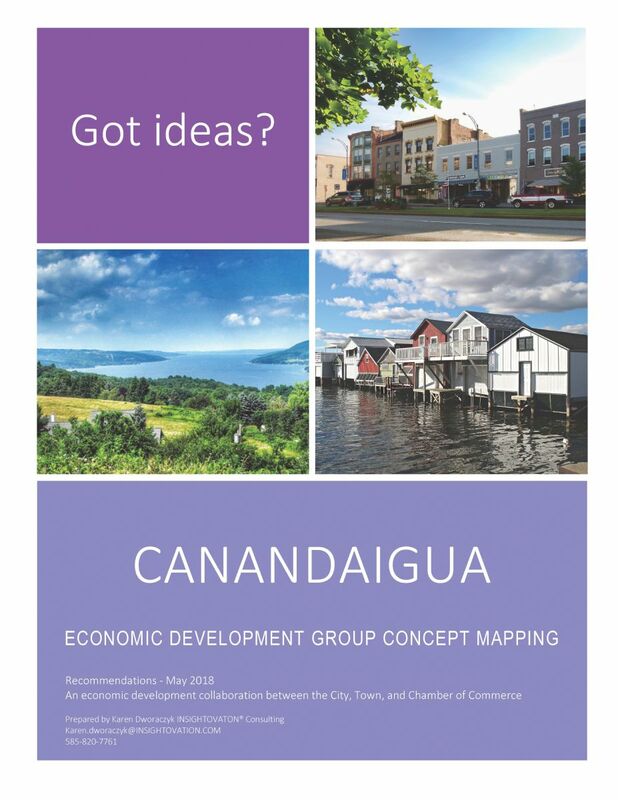 The three entities will now take the data and recommendations from the report and begin to implement some of those ideas generated by the community to improve our economy and outlook for the future of the whole, Greater Canandaigua Community. For questions or comments about the project, see contacts at right (or below if on a mobile device). For information about the process or the software, please contact Karen Dworaczyk, of Insightovation.